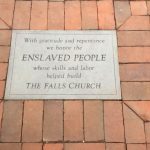 With gratitude and repentance we honor the Enslaved People whose skills and labor helped build the Falls Church. 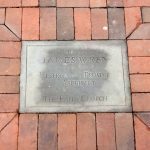 It sits next to the plaque honoring the architect, James Wren, an equal distance from the church. The effort to commemorate the unnamed people who built the church (for which the town is named) started with members of the Tinner Hill Heritage Foundation over a decade ago, and the celebration yesterday included members of the Foundation, the parish, other local churches, local reenactors, and city residents. The dedication even made the local news. 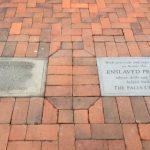 Within the city of Falls Church, the plaque is part of efforts to increase the visibility of the African American community. The new complex on Tinner Hill preserved the stone arch commemorating the first rural branch of the NAACP and inscribed a timeline, of sorts, into the sidewalk along Lee Highway leading up to the arch. Given that Falls Church city became an independent municipality in the late 1940s largely to gain control of the schools, these efforts for creating new sites of public memory are particularly important. There are also currents within the Episcopal Church to recognize its involvement in the practice of racial slavery. The Diocese of Rhode Island, rather than closing a cathedral with declining attendance, has changed the space to a Center for Reconciliation, specifically acknowledging and exploring the involvement of the Diocese in the slave trade. With much of the conversation about public monuments in the last few years dominated by questions of how to deal with memorials we may no longer celebrate, it is interesting to take a moment to think about how new memorials and monuments are created and how they, too, can shape public conversations about (community) history.